​Hailed by international press for her "dizzying speed and sensitivity" Today’s Zaman (Turkey) and “exceptionally high technical level” General-Anzeiger Bonn (Germany), Misuzu Tanaka has established herself as an artist of remarkable individuality with a rare combination of poetic sensitivity and breathtaking virtuosity. She has performed in prestigious concert venues throughout the world, from the Gewandhaus in Leipzig and Mozart’s Museum at Villa Bertramka in Prague to Alice Tully Hall in New York. Misuzu Tanaka is also a respected regular performer for Music from the Frederick Collection, a leading North-American venue for performance on historical instruments. 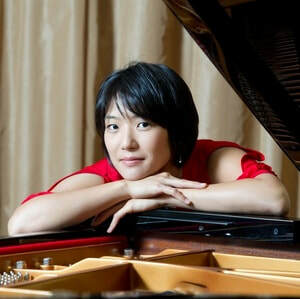 Misuzu Tanaka has achieved notable success in international competitions, receiving prizes and awards in the International Janáček Competition, Poland International Piano Festival Competition and the Daniel Rutenberg Chamber Music Competition. Enjoying an active solo career in the U.S., she is among the country’s brightest emerging stars. Born in London, United Kingdom where she began her piano lessons at the age of five, she then continued her studies in Japan and in the United States with Martin Canin at The Juilliard School. Her Masters and Doctoral degrees are from University of Michigan where she was a full scholarship recipient studying with Logan Skelton and devoted much time to the study and performance of the works of Leoš Janáček, which led to further studies with Miroslav Brejcha and the late Ivan Moravec in the Czech Republic. Our Mission: to promote gifted young pianists and offer them the opportunity to perform in a concert setting. Our History: Artistic Director Josef Sekon, longtime music teacher at Cabrillo College, hosted concerts in his home and other local venues for the past several years. Several St. John's parishioners actively supported this artistic venture in various ways, from hosting musicians to providing financial support, and, of course, serving as a loyal audience. So when the concert series began to outgrow a "house concert" size, St. John's was a logical place to look for a new home. To begin, a parish member has loaned the church a Steinway piano to do justice to the level of the musicianship being shared. St. John's is delighted to partner with Josef Sekon in presenting the Aptos Keyboard Series, henceforth to be known as "The Aptos Keyboard Series at St. John's." It is our hope that we can expand the opportunity from a house concert with an audience of 35 to our larger venue as St. John's, with our wonderful acoustics. And we hope to maintain the intimate atmosphere of a “Salon Setting” for upcoming concerts. ​If you love listening to world class piano music in a relaxed setting please come to this series of Sunday afternoon concerts. We are delighted to accept financial support to help promote these young guest artists in our own community. Explore Gifts. | Exercise Faith. | Engage Our World. T-Th: 9 a.m. - 2 p.m.